Only 25 percent of Americans own a gun and just 3 percent of Americans own half of them. Some of folks own an AR-15 or a dozen. Anyway, back when cars didn’t all look alike, the across-the-street neighbor with the fancy green lawn, would casually pull into their driveway with a new Caddie. What I’m concerned about, is that too many people AREN’T using a picture of their AR-15 as their Facebook cover. Everyone with a combat-style rifle and a computer, please get with the program and get that photo up. Get a snapshot of your 100-round clips, too. How is law enforcement supposed to accurately narrow down the list of suspects after future insane mayhem with incomplete data? Using pictures of AR-15s as the Facebook cover picture has been a thing since before Donald Trump celebrated his 30th anniversary of laundering money for the Russian mob. It was a quiet well-armed affair. They served Trump steaks, none of which were intentionally poisoned. I’ll assume that the guys — it’s near exclusively a male thing — own the guns, and have not borrowed, rented, stolen the weapons or copied a picture. It’s a boastful image aimed at the other gun guys maybe. Like a status symbol or a fashion statement. I’ve been told a thousand times that all guns are just tools, like a hammer — the hammer snipers are the worst — but I haven’t seen any pictures of hammers, screwdrivers or pliers used as the topic of a cover photo or profile picture, so there is reason to suggest that these men have a closer emotional connection with their gun than their hacksaw. I think that’s clear. I haven’t posted a single picture of my toaster, lamp or the slow cooker. Maybe I haven’t cuddled with them enough; like really bonded. But I’m OK with our associations such as they as are. Actually, I’m fine with strained relationships, if that’s their attitude. I’m not here to make friends with gadgets and gizmos. You try to ask, “What’s the deal with the gun(s) picture that might represent your dimly lit inner personality, dude?” Two seconds later, the Facebook gun guy is steamed and he wants to know, “What don’t you understand about the words ‘shall not be infringed? '” and it devolves into a whole thing. I’m not anti-Second Amendment, as it is required to be noted and questioned, but there is no way to convince a true believer that any law change in the name of safety isn’t 100 percent heretical. A wound from a pistol does a fraction of the damage, which isn’t a recommendation to see for yourself. There’s no reason for anyone to own an AR-15, or a comparable rifle, that it so much more lethal than a handgun. I guess they’re fun to shoot. Don’t care. But regardless of the facts, the photos are still a mystery to me, if they aren’t status symbols. Now I’m not saying that dudes with guns pictured as the gateway to their Facebook world do any of those things. I’m speculating it. If anyone is offended, well, thoughts and prayers, it is what it is, and you shouldn’t have climbed that tree to get a better look at the tornado. Then I’m thinking that is just an invite to burgle some guns. That’s why I posted a photo of my gold ingots stacked like a pyramid under my TV in the rumpus room. I enjoy violent intrusions. I’m assuming the guys with the gun picture are planning on shooting anyone who should plan to take their guns or the diamonds in a candy dish on the end table. I’ve read lots of claims to that effect. The NRA Facebook page is infested with fantasy killings. Obama is still out there and he’s in cahoots with Killary to take all the guns, so it’s best to be alert. And if you don’t want a gun-grabbing government or a power-hungry George Soros globalist to confiscate your weapons — 2A purists are against a national registry — the first thing you should do is advertise your ownership on Facebook. Typically, crooks aren’t that bright. Trump is a prime example. Criminals don’t know who has the loaded gun on the coffee table or just a picture of a gun on Facebook. You might run into a criminal mastermind on occasion, but it’s rare. So anyway, the crooks have to decide between the guns and the gold ingots. The last Facebook gun cover I saw had two AR-15’s lying side by side on a beige background. Bragging? Threatening? A two-for-one sale? Is someone being warned off or is this a signal to the others in the band? Some of these hombres like to pose with a gun, and many of them are not wearing a shirt. The majority of them shouldn’t be doing anything without a shirt, including showering. But flexing and declaring, “I have guns and guns,” while kissing a bicep is macho overload. Back when millions of people had equal signs as their profile photo, it was too much for certain folks, and they made their own equal signs with silhouettes of combat style rifles. Boy, that sure taught me a lesson. 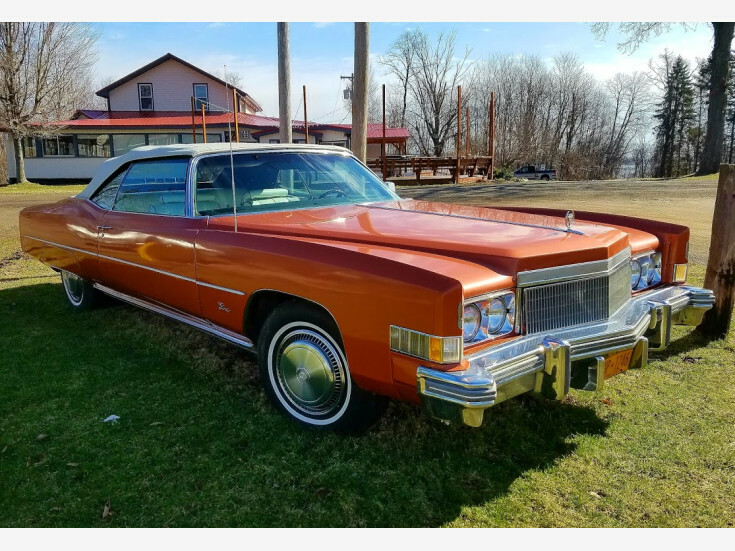 When it came to overt bragging, I liked the 1974 El Dorado much more.